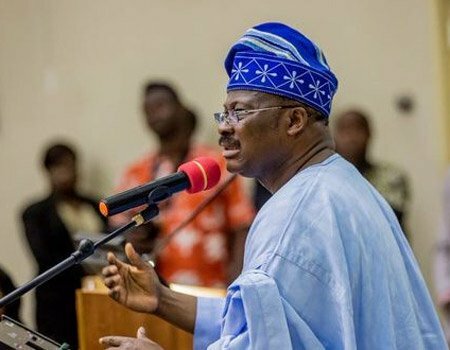 Oyo State Governor, Abiola Ajimobi, has urged Nigerians and security agencies to continue to sacrifice for the peace, tranquility, progress and sustainable development of the country. He said this, yesterday, in an interview with newsmen after the laying of wreath, at the this year’s Armed Forces Remembrance Day, held at the Remembrance Arcade, Agodi, Ibadan. He noted that the sacrifice would culminate in the conduct of free and fair polls during this year’s general election. The programme was also attended by the General Officer Commanding (GOC), 2 Division of Nigerian Army, Major General Okwudili Azinta; Commander, 671 NAF Detachment, Ibadan, Air Commodore Kolawole Shittu and Commissioner of Police in Oyo State, Mr. Abiodun Odude. Top officials of the state government in attendance included the Deputy Governor, Moses Adeyemo; the governor’s wife, Florence Ajimobi; Secretary to the State Government, Olalekan Alli; Commissioner for Women Affairs, Community Development, Social Welfare and Poverty Alleviation, Atinuke Osunkoya; as well as Chairman, Nigerian Legion, Oyo State Command, Michael Fajimi. Ajimobi said: “I think we should maintain peace. Let us make it a free and fair election. Let us unite and make sure we continue to sacrifice for Nigeria. In sacrificing for Nigeria, we’ll maintain peace, tranquility, progress and sustain development. The governor, however, enjoined serving security personnel not to relent in their efforts to protect the territorial integrity of Nigeria, against any form of aggression. “We should ensure they continue to protect the country and ensure the integrity of Nigeria is maintained in all ramifications,” Ajimobi said.